My inspiration for my final project has shifted away from my blog post on modular design. I just couldn’t come up with a design that I could incorporate that inspiration into. After a lot more brain storming and looking at different artist on the internet I was able to find some inspiration for my final piece. 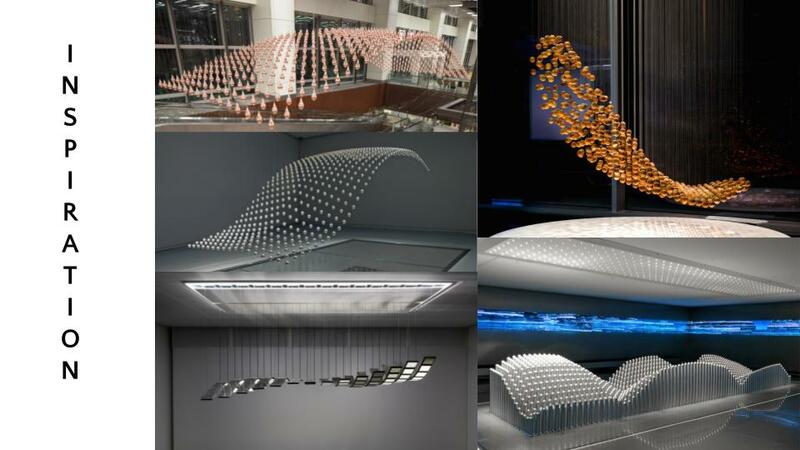 My first piece of inspiration came from hanging kinetic art installations. In the pictures below they look static, but they actually have some very complex mechanical systems working in the background to create some sort of movement. I really like the minimal and modern aesthetic and how well they flow visually. The movement patterns that theses pieces create force the viewer to stop and study the piece. A glance is not enough to understand what is going on. My second piece of inspiration come from the work of Matt Shlian. Unlike the previous inspiration, his work is static. There are no moving pieces, just hundreds or thousands of pieces of paper. I really enjoy his aesthetic that is very geometric in the small scale but also very organic at a large scale. He creates movement in his pieces just based of the shapes and orientation of the different pieces. There are many layers to his work and I really appreciate that. For my final project I will be blending my two sources of inspiration to make a kinetic wall piece for my room. 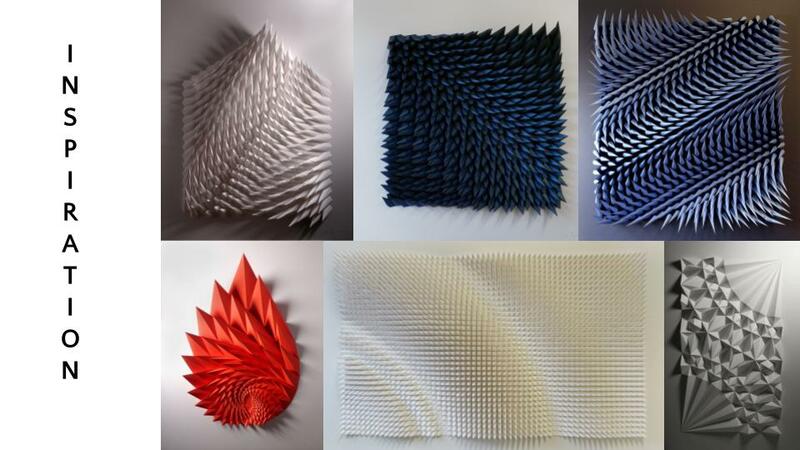 I was between two aesthetics when I was making my prototypes but after discussing it with my pod, I will be going for the geometric(spiky) aesthetic like the first picture below. There will be a mechanical part underneath that creates the movement on the surface layer. I know have to decide what kind of movement I want to create in the top layer, such as ripples or waves, or if I want to make it completely random. Below are the two prototypes I made to model the aesthetic part of this project. Soon after I had my prototypes done, it was time to start sketching what the mechanical system that manipulates the top surface would look like. There will be roughly ten axles that are all connected to a single motor that run lengthwise down the piece. on the axles there will be some irregular circular disks that rotate along with the axle. There will be pins that sit on top of the disks and as the disk rotate, the pins will move up and down. This is what will create the movement on the top layer. I love your project idea. The wave and movement of the spikes are definitely very intriguing and will act as a great attention grabber. Overall, I am super excited to see your final product. Andre, I really like your project and I am very intrigued by your inspirations. I am sure your final product will be very cool however I would try to add more of your own style. Excellent work! This is such a cool idea! I definitely like the spikes more and I think when it is at a bigger scale, it will have more of an organic look even though each individual piece is geometric. I really like the spike idea that you have. I was wondering if you were going to 3D print the parts or use some other method to get the aesthetic across. I like the spikes! I agree with comments people made about contrast and visibility. Fabricating the structure seems somewhat straightforward. Although, the functionality will be much more time consuming to implement. I would fabricate some prototypes first just to start working with the motion components. The idea is very good. I really like it. The pattern and the movement created by the design will achieve you goal of making people look at it for some time to figure it out. I am sure that your final product will look great.